Twelve years ago, a catastrophic event in the country of Rimguard caused massive devastation and the disappearance of all Rimguardians. Now, in the Enastria Empire, sisters Yui and Rena lead a peaceful life until one day, a giant mecha appears, setting in motion a series of events that threaten to revive an ancient relic from the past. That doesn’t sound that bad, does it? Problem was… that there were plenty of problems. Perhaps the biggest of those problems was how the story felt far too rushed. Thirteen episodes just wasn’t enough time to properly flesh out the characters and build a compelling world, so we’re left with story elements that are glossed over and neglected. Also, it was easy to predict which direction the story would go, so for me at least, the drama felt uninspired and lackluster. There was the occasional slice of life moment that felt like a welcome change, and call me crazy, I kind of enjoyed that more than the mecha-on-mecha violence. While it’s not out of the question that we could potentially get a second season to try and fix some of the issues present here, the production issues, lukewarm reception, and general lack of any hype will probably prevent that from ever happening. Given the issues with the story, it’s not that surprising to me that I didn’t come to love the characters. Yui and Rena weren’t all that bad, but I felt as though I was never as attached to them as I should have been. That’s especially true in Rena’s case, as her backstory was interesting, but didn’t quite get the attention it deserved. I think the exact opposite could be said of Yui, as her backstory was pretty bland, yet there was more than enough of that. At least the sisterly bond Yui and Rena shared was quite nice, and that’s not even taking into account the yuri vibes between those two. 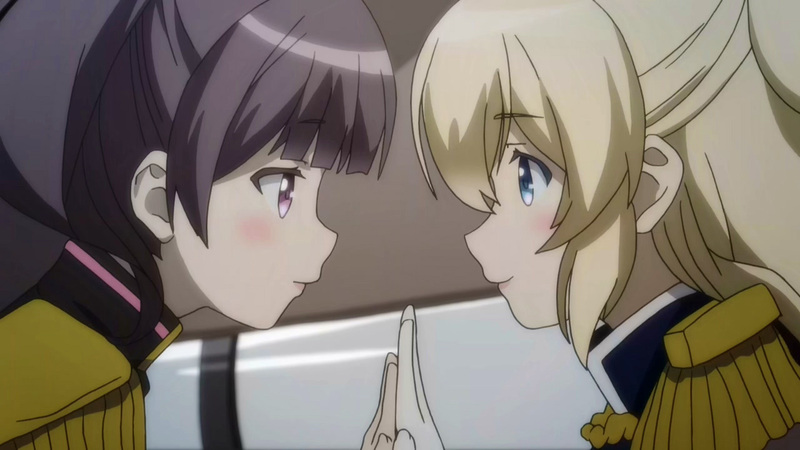 While it’s true that the moments they shared together throughout the anime were sweet, I was still disappointed in the overall level of yuri content. This is one of those anime where the deep emotional bond between the characters is mostly where the yuri vibes reside, and there isn’t much beyond that. Being sisters, that’s kind of expected, though, (to me at least) there are never any overt hints that their relationship is more than just sibling affection. It also didn’t help that Rena has the appearance of a child, though, I could understand people seeing things between them a bit differently. The other pairs are even less shippable, but it’s really all about Yui and Rena in this show. Retsu has a couple of touchy-feely moments with the girls, yet those are mostly comedic in nature. So ultimately, there’s some subtext to be found here, though I don’t view it as something much more than typical affection between siblings. 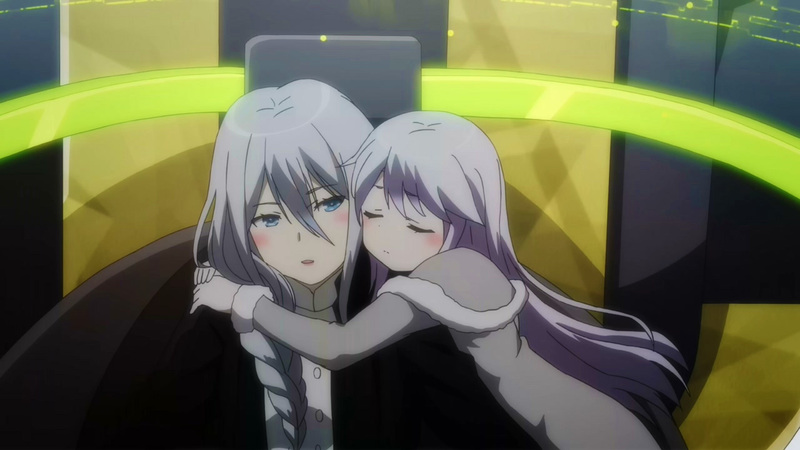 Moving on to the other characters, Ingrid and Kei were another pair of sisters that get caught up in all of this, and despite my hesitancy to embrace Yui and Rena, Ingrid was another case altogether. She became my favorite character in the show, what with her mysterious presence, caring heart hidden beneath a cold exterior, and striking good looks and all. Kei was pretty low-key, so there isn’t much to say other than she was just cute as hell. The final pair are sisters Tia and Sara, who along with supporting character Retsu, serve largely as the comic relief of the show. Their screen time brings with it a fluffier atmosphere, and after Kei, I thought that Tia was definitely the cutest character in the show. Tia and Sara’s stories are also mostly glossed over as well, so add them to the list. It is kind of weird that all this moe is present in a mecha anime, but I’m not complaining. Last but definitely least, let’s briefly mention who all these cuties are facing off against. Despite being a hateable character, Johann was a generic antagonist whose motivations are typical bad guy fare that we’ve all seen a million times. Pretty much everything about him is utterly forgettable, and in case you couldn’t already tell, I didn’t like him at all. Overall, the character development is somewhat hampered by the storytelling limitations, though it can’t all be blamed on that. The characters are underwhelming, and to me, that certain je ne sais quoi is either missing or is in short supply. When it comes to the visuals, it’s a bit interesting. Nowadays, you don’t often see mecha anime that is still being hand-drawn, as CG has become the de facto standard used to animate these giant robots. There are differing opinions as to which method is better, but Regalia falls squarely in the hand-drawn camp. Personally, I’ve seen enough poorly implemented CG in anime to not mind at all that this show chose to go in that direction, and it helps that this is, generally, a solid-looking show. The mecha battles themselves didn’t really show any ill effects from the production delay that pushed the series’ completion back nearly a couple of months, but that’s not to say that Regalia is giving the Gundam Unicorn‘s of the anime world a run for their money in the visuals department, because it’s definitely not. Still, the effort to do things the old-school way is appreciated, as is the willingness for the creators to admit that the show wasn’t meeting their standards. So even though the animation wasn’t one of the show’s problems, without question, the audio was the one aspect of this show that I felt like was its greatest strength. The sound was another aspect of this show that the producers weren’t satisfied with, but you probably couldn’t guess that by listening to the finished product. Not only did the background music do wonders for the atmosphere, the ambient noise and sounds effects were very nice as well. There isn’t really anything negative or overly positive to say about the voice-acting, and I thought that the OP and ED themes were pretty nice as well, so it’s understandable why I thought that this was a bright spot for Regalia. This entry was posted in Anime, Anime Review and tagged Regalia by Rock The Vogt. Bookmark the permalink. That doesn’t happen with Regalia. Not for me, at least. It’s ok enough to be a “companion” for lunch or dinner, but that’s all. Haven’t seen the anime, and now, don’t plan to, so thanks for that, as well. I just googled moecha. Good thing Latin is a dead language, or there might be some confusion. That makes perfect sense. I should’ve mentioned that they would be sold only in Japan, and since they love their cute girls doing lewd things, they’d all be scantily clad in the advertisements. And naturally, the official company mascot would be an octopus. So, could i get a Venti Caramel Moecha-hiato, Skim, Extra Shot, Extra-Hot, Extra-Whip, Sugar-Free. Oh, and an octpus plushie as well, please. (Had to google “Most obnoxious starbucks orders” for help on that one). 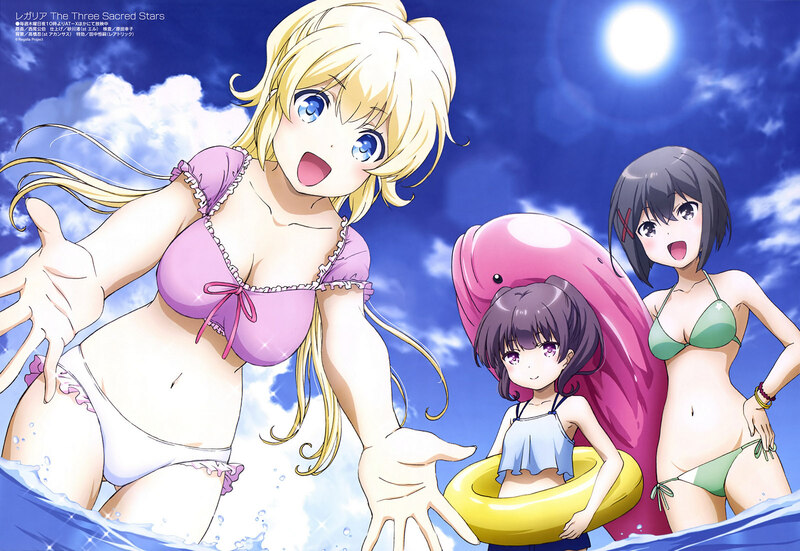 Maybe it’s cause I’ve never seen Kannadzuki past the first 2 or 3 episodes but…I actually really enjoyed this show ._. Though, I’m sure it’s just me, as I’ve seen a lot of distaste for it in many places. So it must have done something wrong, it just ended up being my sort of “right”. Moecha eh? Why does that remind me of Gochuumon and bunny mascots? 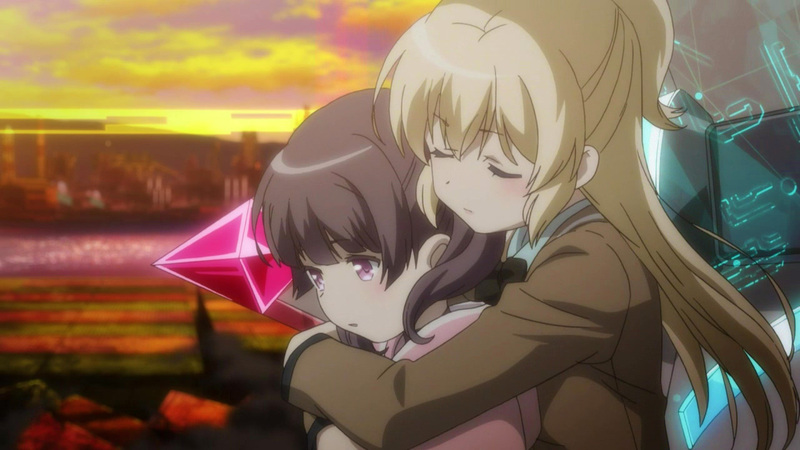 Trust me: it’s actually more strange if a yuri fan likes the mecha action more than the slice of life segments. Okay to good show, but you can cut the je ne sais quoi with a knife. But something that shouts out Gochuumon and Kannazuki can’t be a complete write-off? Personally, I don’t like mecha anime at all. I can tolerate it, but I won’t go seeking it out or anything. To bad they didn’t use that delay to make the story good because there was some potential there. Good visual will only get you so far. Also I must have been bored at some point because I don’t remember them saying where the regalia came from. I agree with everything you said except part of the sound. The music was good, but the sound effects for the battle scenes were horrendous and repetitive, as if the sound producers thought it was a good idea to make all smashing noises sound like a mix of a boom and crackling paper. I had a lot of hope for Regalia, too, but it’s most redeeming qualities were its animations and Ingrid. It’s sad how many studios don’t hand-draw battle scenes anymore.